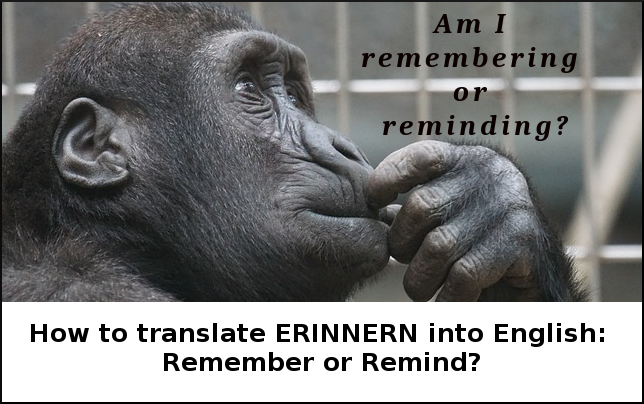 When a Germans learn English, or when Americans learn German (I know from experience), some things are actually quite easy. In my opinion, the main one is VOCABULARY. There are many words that are the same, or nearly the same, in both languages. However, it's not always so simple. But lucky for you, I've collected the most common vocabulary mistakes that Germans make when speaking English. To see if you make the same ones, take this test. Simply translate the following paragraphs into English. But be careful, it's not as easy as it looks! 1 – Mein Chef ist so streng! Heute hat er mir nicht erlaubt, meine Frau während der Mittagspause anzurufen. Check your translation against mine! My boss is so strict. Today he didn’t allow me to call my wife during our lunch break. Chef/chief are false friends – The person you work for is NOT your chief. Streng/strong are false friends – Streng means strict, and stark means strong. 2 – Ich darf auch keine französische Küche da essen, weil Frankreich Deutschland im Fußball besiegt hat. I am not allowed to eat French food (or French cuisine), because France beat (or defeated) Germany in football (or soccer). Don’t say ‘French kitchen’ – it doesn’t mean französische Küche. We use the phrase French food or French cuisine. 3 – Dummerweise habe ich letzte Woche meinem Chef mein Handy ausgeliehen. Er wollte Fotos von unserer Fabrik machen. Er hat es gestern kaputt gemacht. Last week, I stupidly lent my boss my cell phone (or mobile phone or smartphone). He wanted to take photos (or pictures) of our factory. Yesterday he broke it. In English, we take photos (we don’t make them!). 4 – Aktuell verdiene ich weniger Geld als vor 2 Jahren. Mein Chef hat gesagt, dass ich eventuell mein altes Gehalt bekommen könnte, aber ich glaube ihm nicht. I currently earn less money than I did 2 years ago. My boss said that I might (or may) receive my old salary, but I don’t believe him. 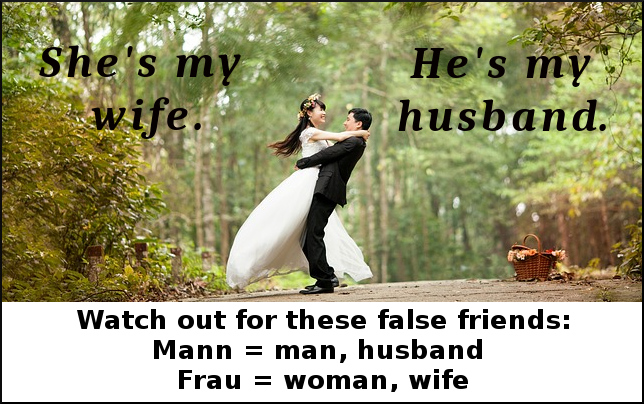 Aktuell/actual are false friends (aktuell = current/currently, eigentlich = actual/actually). In this case, vor means ago, NOT ‘for’. Bekommen/become are false friends (bekommen = receive, werden = become). 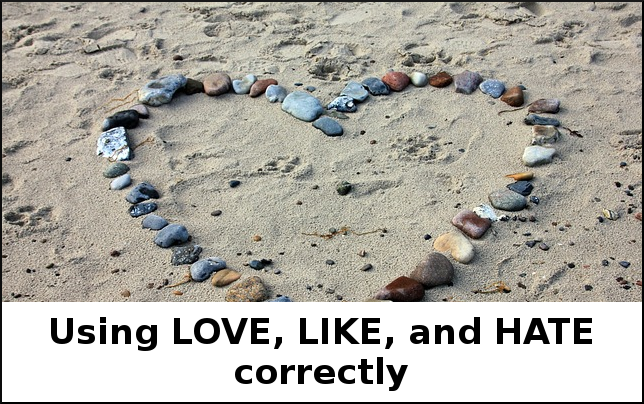 Eventuell/eventually are false friends (eventuell = maybe/perhaps, letztendlich = eventually). 5 – Er ist auch gar nicht sensibel. Aber diese Geschichte ist zu langweilig. Über dieses Thema können wir gerne reden. He also isn’t very sensitive. But that story is too boring. We can talk about this topic later. Sensibel/sensible are false friends (sensibel = sensitive, vernünftig = sensible). Thema/theme are sometimes false friends. In this case, we should use topic (the subject we are speaking about). Theme is used to talk about the main idea of a book, movie, or play. 6 – Ich arbeite bei meinem Unternehmen seit 5 Jahren, aber ich kann das einfach nicht weiter machen. Mein Job macht einfach keinen Spaß! I have worked for my company for 5 years, but I simply can’t continue. My job just isn’t enjoyable (or fun). We work for or at a company, not by a company. 7 – Ich habe mich entschieden, bis Freitag zu kündigen! Dann habe ich endlich frei! I have decided to quit (or resign) by Friday. In English, decide isn’t reflexive. In this case, bis means by (not until)! So, how did you do? If you have any questions, feel free to email me at Nick@EnglishWithNick.de or write in the comments below. 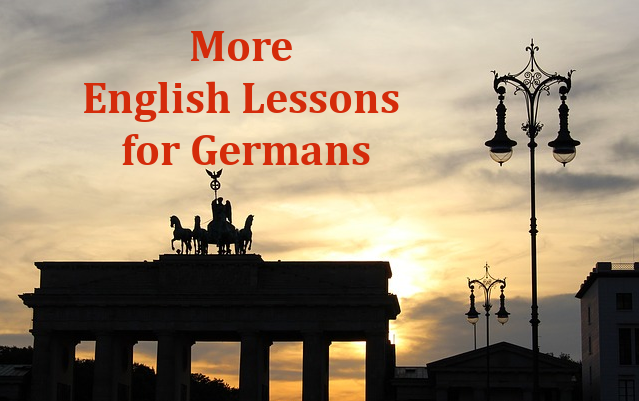 For more of my English tips that I made especially for Germans, click here.